Electric cars from Renault and Nissan have driven approximately 841 million zero-emission kilometers — enough to circle the earth more than 20,000 times. Together, they represent 53 million liters of oil saved and 124 million kg of CO2 that have not been emitted. 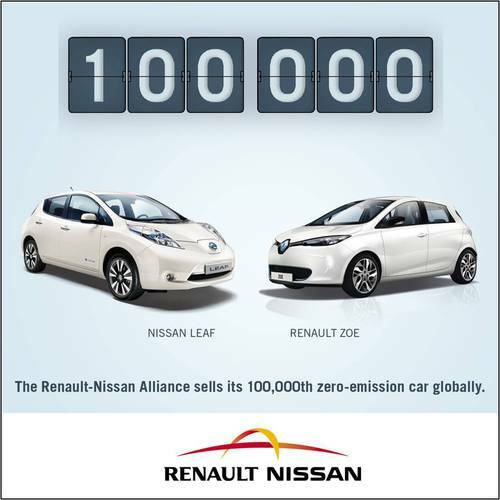 Nissan LEAF won the 2011 World Car of the Year, European Car of the Year 2011 and Car of the Year Japan 2011-2012 awards. The top markets for Nissan LEAF are the United States with about 30,000 units, Japan with 28,000 units and Europe with 12,000 units. Renault leads the electric vehicle market in Europe with a 61% share, including Twizy. Renault’s top markets in Europe are France, Germany and Italy.